The $10 MagSafe to MagSafe 2 Converter is annoyingly expensive, but it's better than buying new gear. And now for $15 you can adopt an annoyingly expensive, but ingenious way to keep track of the tiny dongle. It's the Apple way. 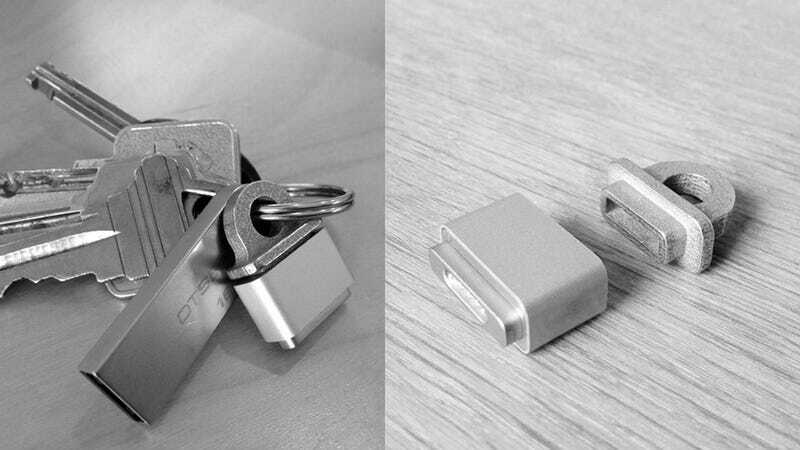 The MagSafe Adapter Key Ring, created by Jonathan Bobrow, is 3D printed from stainless steel and uses the MagSafe converter's internal magnet to hold everything together. Bobrow claims that the magnet is much stronger than people might think, because usually we create torque from the charger cable to get it off. There were some blissful years when MagSafes abounded and anyone who had a Macbook could find solace in a stranger at Starbucks if they lost their charger or their way. But in these treacherous, next-gen days only a steady diet of cash and 3D printing can save you.